You brush your own teeth every day, right? And you get regular dental cleanings, don’t you? We’re not here to judge your oral hygiene, but we have a feeling your dog’s teeth and gums don’t get the same amount of care and attention as your own. And we get that. But did you know that by the time they’re 3 years old, most pets suffer from some form of dental disease? Slacking on dental care could lead to painful periodontal disease, tooth loss or worse. Gum disease can be avoided altogether but it takes a bit of effort at home. Veterinarians agree it is well worth the effort. By making dental care a regular part of your routine, you can improve your dog’s teeth, help her enjoy a healthier, more enjoyable life and minimize the need for costly dental treatments at the veterinarian’s office. Make sure you ask about your dog’s teeth during checkups, and try to get that checkup at least annually. You can also ask the vet whether your dog is at particular risk of dental health problems and what kind of preventive care she might recommend. 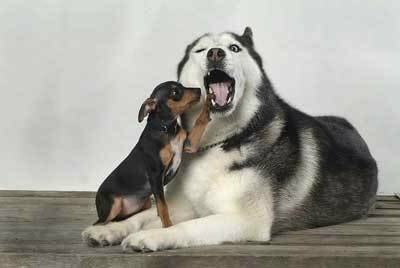 If your dog has current dental issues or is at higher risk, consider asking for a referral to a veterinary dentist. Also ask about any products that might be damaging to teeth such as chews that are too sharp or hard. 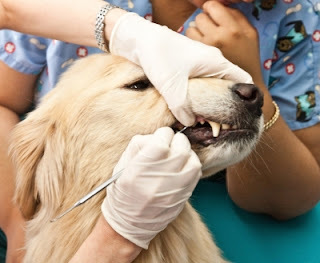 Your vet will inspect teeth and gums, remove tartar and plaque, and take x-rays. If any teeth are loose or diseased, they'll be pulled. Once you get the all clear, let the brushing begin! Chewing is a natural behavior in dogs - one that can also benefit their oral hygiene. Chew toys and ropes, bones, rawhide, and chews provide friction along the gumline and act as natural flossers. Provide your dog with chew toys that are an appropriate size and shape, and let them start chomping their way to healthier teeth. Be sure to replace chew materials when they are worn, and provide durable toys and bones to aggressive chewers. If your dog has sensitive teeth, try latex toys and other softer chewing materials. The single best preventive treatment is brushing to break up bacterial films on the teeth before they develop into plaque and cause damage to teeth and gums. When it comes to toothpaste, a palatable, meat-flavored paste is going to be more fun for you dog. Do not use human toothpaste because the ingredients can be irritating. Make sure you select an applicator that is right for your dog’s size and gum sensitivity. Options range from brushes to rubber fingertip applicators and presoaked dental wipes. Brush the outside surface of the teeth in small circles, avoiding any contact with the gums. Using veterinary, species-specific toothpaste is essential. Human toothpaste has too much fluoride and is toxic for animals. You'll find animal-friendly flavors, like chicken, mint, and peanut butter, at most pet stores. 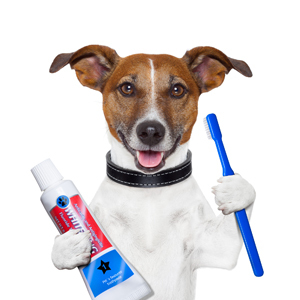 While not a substitute for brushing, medicated rinses may help by making the surface of your dog’s teeth less hospitable to plaque and bacteria. Ask your veterinarian for a recommendation and then simply add the product to your canine’s water or spray it in his mouth. Medicated rinses can also help combat stinky breath — a win-win for your pup’s oral health and your nose. Diet can factor into overall dental health in a variety of ways. Make sure to feed your pets nutritionally balanced dog food. If tooth health is an issue, try using specially formulated dry foods that don’t crumble as easily to wear away plaque and tartar with chewing.Your veterinarian may recommend feeding your dog a specially formulated dental diet to help improve his oral health. This type of kibble tends to be larger and usually has an abrasive texture to aid with cleaning teeth and removing plaque build-up. Dental foods may also contain ingredients that help reduce tartar formation. These tasty snacks contain beneficial nutrients that aren't found in most dog foods. Talk to your vet before making a major change to your dog’s diet, and make sure to choose dental health food that has the Veterinary Oral Health Care (VOHC) seal. Avoid feeding your pooch table food, especially scraps that are high in carbs and sugars. And since dogs tend to eat pretty much anything, make sure your pets do not have access to trash, yard debris, or anything else they shouldn’t be munching on.